To G-Sync or not to G-Sync. That is the eternal question when buying a gaming monitor these days, especially when cheaper AMD FreeSync monitors such as the Iiyama G-Master GB2760HSU on test today can now also take advantage of a watered down G-Sync-esque experience thanks to Nvidia finally opening up their variable refresh rate standard at the beginning of the year. 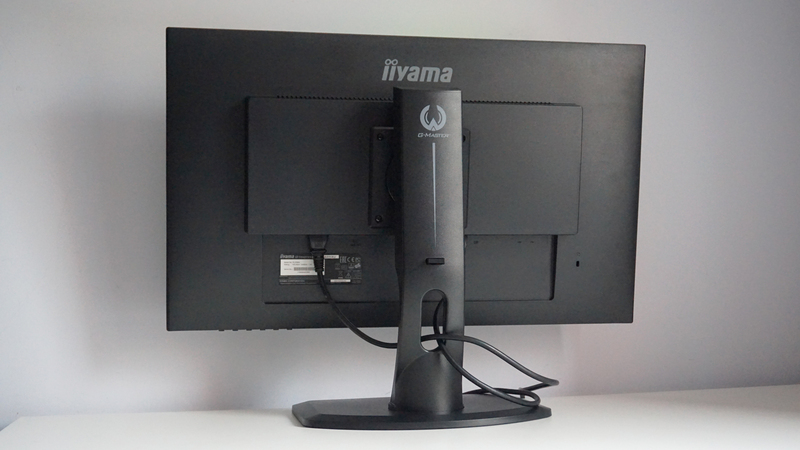 Iiyama’s GB2760HSU isn’t, I should note, one of Nvidia’s official G-Sync Compatible monitors, but after testing it out for myself over the monitor’s DisplayPort 1.2 input, the experience was pretty decent. There wasn’t any blanking (that is, black frames being inserted), nor was there any pulsing or random brightness changes, or any screen tearing. The only obvious defect was a bit of stuttering, which isn’t ideal in fast-paced games such as Doom, but it’s still perfectly serviceable for those after a taste of what G-Sync can do without shelling out loads of extra cash. 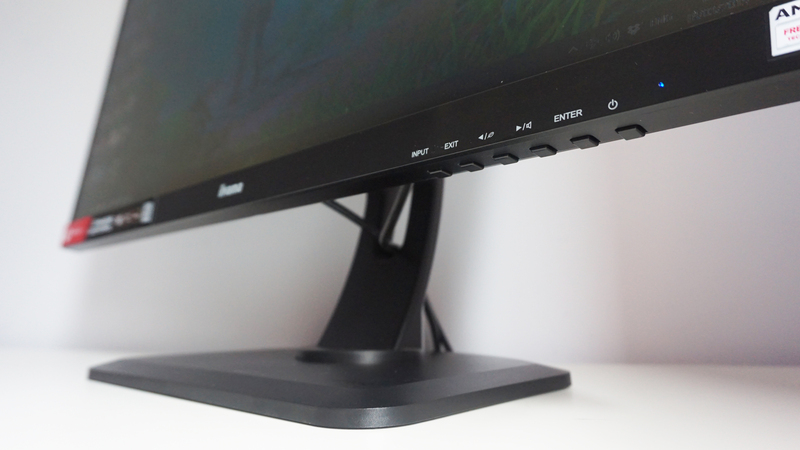 Can the Iiyama GB2760HSU break into our best gaming monitor rankings, though? Let’s find out. 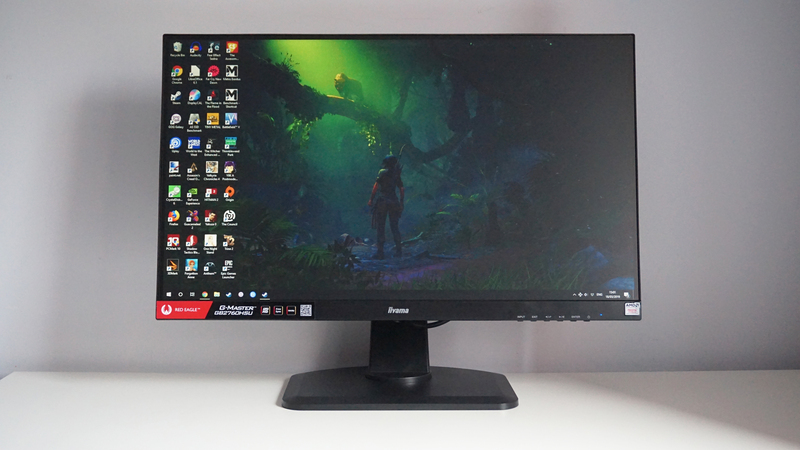 The G-Sync stuff is all good news, but as you can see from that specs table over there, the GB2760HSU does come with one big caveat – and that’s its resolution of 1920×1080. Spread across a 27in panel, this is something that really bucks up against what I consider an acceptable pixel density these days and, for me at least, it does detract from the monitor’s overall appeal as a result. Things aren’t blurry, per se, but they are noticeably fuzzy around the edges, particularly when you’re dealing with text or browsing the web. It’s less noticeable in games, to be fair, so you’ll probably be fine if the monitor’s main purpose is going to be a full-time gaming screen. However, if you’re going to be using it for regular desktop duties as well, then I would strongly urge you to consider spending a little bit more on a monitor with a 2560×1440 resolution if you really want one that’s 27in in size, as your eyes will thank you for it in the long run. Fortunately, the GB2760HSU does come in a 27in, 2560×1440 model (the GB2760QSU), as well as a smaller, 24in version with the same 1920×1080 resolution (the GB2560HSU). Without having tested these models myself, however, it’s hard to say whether they’ll offer a similar, worse or even better G-Sync experience when paired with an Nvidia graphics card. Still, all three use a TN panel, so the one thing that is likely to be comparable is the monitor’s overall image quality. And the good news is that the GB2760HSU’s sRGB colour gamut coverage is only a couple of per cent behind the very best G-Sync TN monitors I’ve tested such as the Acer Predator XB241H and Alienware AW2518H. Whereas those monitors each cover around 95% of the sRGB gamut, my X-Rite i1 DisplayPro calibrator showed the GB2760HSU is capable of showing 92.3% of it on its default 6500K colour temperature setting, which is pretty decent considering TN panels quite often have quite poor colour accuracy. Indeed, that’s actually better than the sRGB coverage you’ll find on the IPS panel used in Philips’ 276E9QJAB (another 27in 1080p monitor), and that’s a screen that touts itself as an ‘ultra wide colour’ display. Admittedly, I was a little disappointed to see the Iiyama’s sRGB figure fall back to 89.6% when I tried calibrating the display to bring its RGB values in line with each other, but 92% out of the box is still pretty good, all things considered – if only because it means you don’t have to spend ages fiddling around with Iiyama’s onboard menu system to get the best out of it. Its viewing angles were pretty good, too, and even looking at the monitor from the side didn’t produce a major shift in contrast or colour reproduction. It also comes with several other gaming modes, such as special FPS, Strategy and Sport Game presets, but these tended to make the screen look even worse while locking off all brightness, contrast and colour controls. As a result, those after the best colours should still with its 6500K colour temperature option and leave its so-called ‘I-Style’ modes switched off. Admittedly, the GB2760HSU’s contrast ratio of 741:1 was slightly less impressive, and it often meant that darker games such as Little Nightmares tended to look a bit flat and washed out in the old shadow department. However, there wasn’t any noticeable banding going on, which can sometimes happen when monitors with pants contrast struggle to distinguish between all the different shades of grey onscreen, and on the whole I’d say it still produced a decent enough picture in these gloomier scenes to carry on playing without issue. 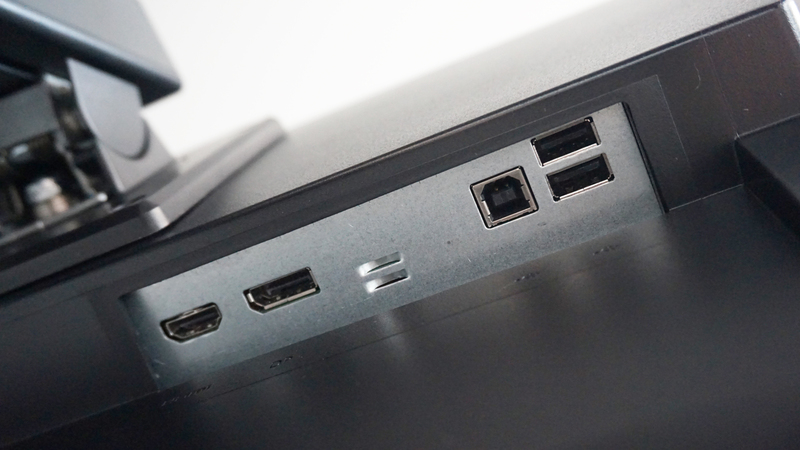 The two USB ports are only USB2, sadly, but it’s still better than none at all. The GB2760HSU may struggle a bit if you happen to be using it by a sunlit window, though, as its peak brightness only reached a maximum of around 300cd/m2, and more often than not tended to settle around the 260cd/m2 mark – which is a far cry from Iiyama’s claimed figure of 400cd/m2. That’s still more than enough for everyday use under normal lighting conditions, to be fair, but it’s always useful to have that extra bit of leeway to account for particularly sunny afternoons or bright, overhead lighting, for example. Still, when you add in its height-adjustable stand (a lot of cheap 27in 1080p monitors tend to only come with fixed ones), a two-port USB2 hub (which again is another rarity, even if it would have been nice if they were the faster USB3 standard instead), its 144Hz refresh rate and dual FreeSync and G-Sync compatibility, the Iiyama GB2760HSU adds up to a pretty decent package. Indeed, the only other monitor you might want to consider instead of the GB2760HSU is the BenQ EW277HDR, which has a higher quality 27in, 1920×1080 panel than the Iiyama (plus the ability to do a bit of HDR) and costs even less, as you can currently pick it up for just £157 in the UK right now and $194 in the US. It doesn’t come with a height-adjustable stand or any of the Iiyama’s extra refresh rate features, all told, but if all you’re after is a cheap, great-looking 27in monitor, then the BenQ is pretty tough to beat at that price. However, if you do want the stand and high refresh rate and don’t mind the fact it only has a 1920×1080 resolution, the Iiyama G-Master GB2760HSU is a great place to start for those looking to keep costs down to under £300. If the resolution’s going to bother you, though, then you’d be better off dropping down a size and spending just a fraction more on the excellent (and our best gaming monitor G-Sync champ) £375 / $350 Acer Predator XB241H instead.